Fear of demolition triggered hearing on six-story building within proposed Borough Hall Skyscraper Historic District. On January 4, 2011, Landmarks heard testimony on the potential designation of the Franklin Building at 186 Remsen Street as an individual City landmark. The vacant building is within the proposed boundaries of the Borough Hall Skyscraper Historic District, but was calendared separately on December 7, 2010 due to “threat of demolition” after the building owner filed a demolition permit application with Buildings. Chair Robert B. Tierney explained that Landmarks was concerned that the owner would demolish or alter the building before final deliberations on the proposed historic district had taken place. The Parfitt Brothers designed and built the Queen Anne-style Franklin Building in 1887. The six-story building is clad in red brick with stone trim and terra cotta ornament, and its sandstone base features a large arched entranceway. The building lost its original roof around 1950 when the top one-and-a- half stories were removed and replaced with a simple brick parapet. At the January hearing, architect Ted Bodnar, representing the building’s owner, testified that the building had been vacant for seven years and was in a state of disrepair. Proponents of designation included representatives of the New York Landmarks Conservancy and the Brooklyn Heights Association. 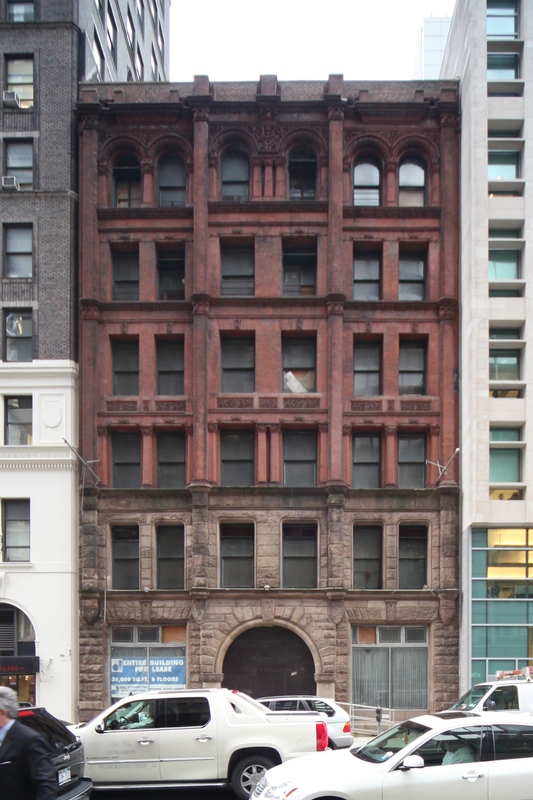 The Historic Districts Council’s Simeon Bankoff testified that despite its alterations, the building merited designation based on its “architectural patrimony” and design features. Chair Tierney stated that it was “his understanding” that Buildings would not issue a demolition permit and the owner agreed to enter into a standstill agreement with Landmarks after the hearing. Tierney closed the hearing was and did not set a date to vote on the designation. LPC: Franklin Building, 186 Remsen St., Brooklyn (LP-2465) (Jan. 4, 2011).